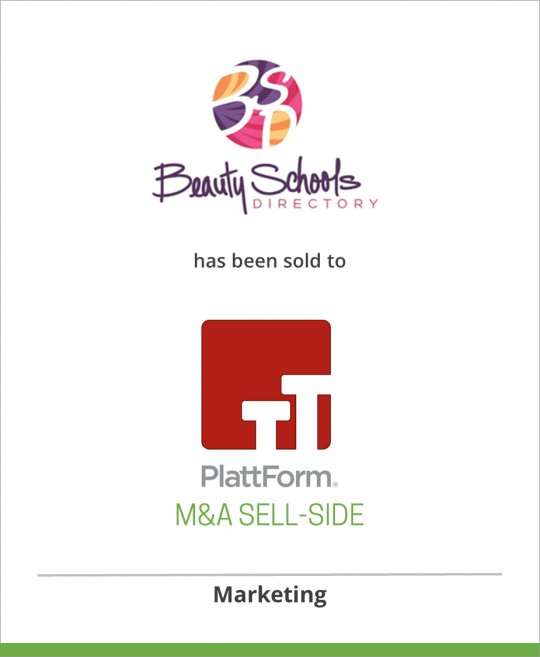 Beauty Schools Directory, an enrollment lead generation company, has been acquired by PlattForm Holdings, a marketing firm for higher education. Beauty Schools Directory, owned by Zuma, LLC, is the most comprehensive, useful and informative online resource for prospective beauty school students, enabling users quickly and easily to locate, compare, obtain information and contact thousands of beauty schools and cosmetology schools throughout the United Stated and Canada. It is the foremost provider of lead generation for both not-for-profit and for-profit educators with beauty school education programs. PlattForm Holdings, Inc. (www.plattformad.com) is a leading enrollment solutions provider to the post-secondary education industry. The company’s enrollment solutions include internet marketing services, media placement services for the television, print, and radio markets, creative and production, direct mail services, public relations, and call center services, all of which are designed to assist clients in attracting, enrolling and retaining students. Within PlattForm’s industry leading internet marketing product line, enrollment solutions include search engine optimization, affiliate marketing, pay-per-click advertising, and website design and development. PlattForm also has its own developed websites, such as www.search4careercolleges.com and www.careerexplorer.net which provide information to potential students and leads to schools on a guaranteed cost per lead basis. PlattForm offers enrollment solutions to both for-profit and not-for-profit school groups, as well as to select segments of the U.S. Armed Services. The company is headquartered in a suburb of Kansas City, and has more than 350 employees. Michael Platt, its CEO, is a leading expert in the post-secondary education industry, and serves on the Board of the Career College Foundation. Arlington Capital Partners (www.arlingtoncap.com) is a Washington, D.C.-based private equity fund with over $1 billion of committed capital focused on middle market buyout investment opportunities in growth industries including: aerospace/defense, federal and commercial IT and engineering services, media, education & training, healthcare services and business services & outsourcing. The firm’s professionals have a unique combination of operating and private equity experience that enables Arlington to be a value-added investor. Arlington invests in companies in partnership with high quality management teams that are motivated to establish and/or advance their company’s position as leading competitors in their field.